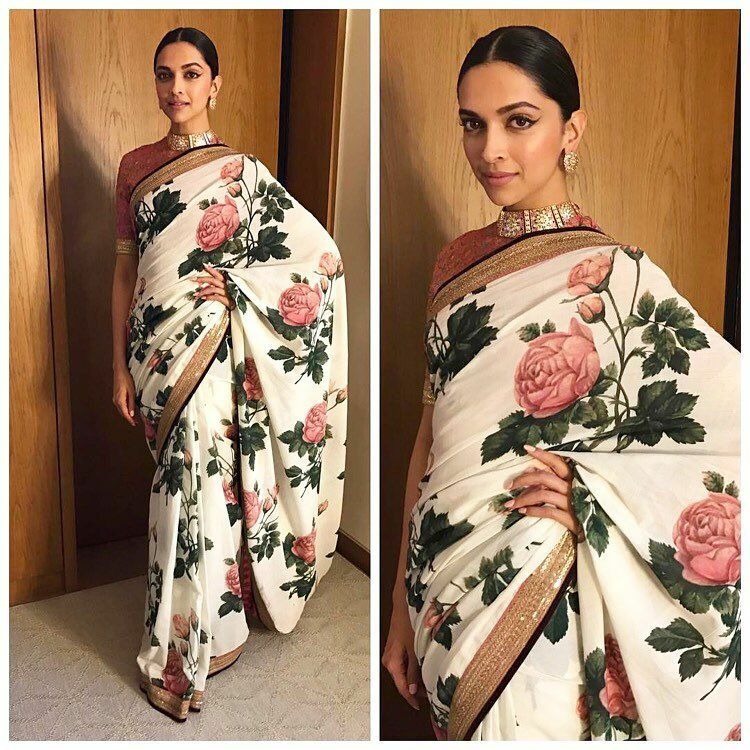 Deepika Padukone was recently seen in a hand-painted Sabyasachi saree that made her look like a personification of spring. She was draped in khadi, with hand-painted flowers all across. And, Dips looked like a dream in the number, which seemed to be as light as the air. Sabyasachi is a designer who is noted for actively working to revive and reinvent handloom sarees and working with traditional motifs, designs, embroideries, styles, etc. It’s no wonder that he had to play with wonder of hand painted sarees. Many other designers and artists, like Sabyasachi, are turning the saree turn into canvas for hand-painted art, and this is not something new. They have drawn inspiration from the traditional styles, like the Kalamkari style of Andhra Pradesh, or the Patachitra handloom of Orisha. Of course, there are other traditional designs that use paint to make the base saree beautiful, like the Bandhani or tie-and-dye, the Bagh method of block printing, the Ajrath printing method, etc. These are artistic processes of making beautiful handloom pieces with meticulously created details, and the lessons are handed down from one generation to the next. And now, artists are using their signature creativity to create unique sarees. They are mixing fabrics and style that are originally from separate parts of the country. They are adding fresh new ideas. 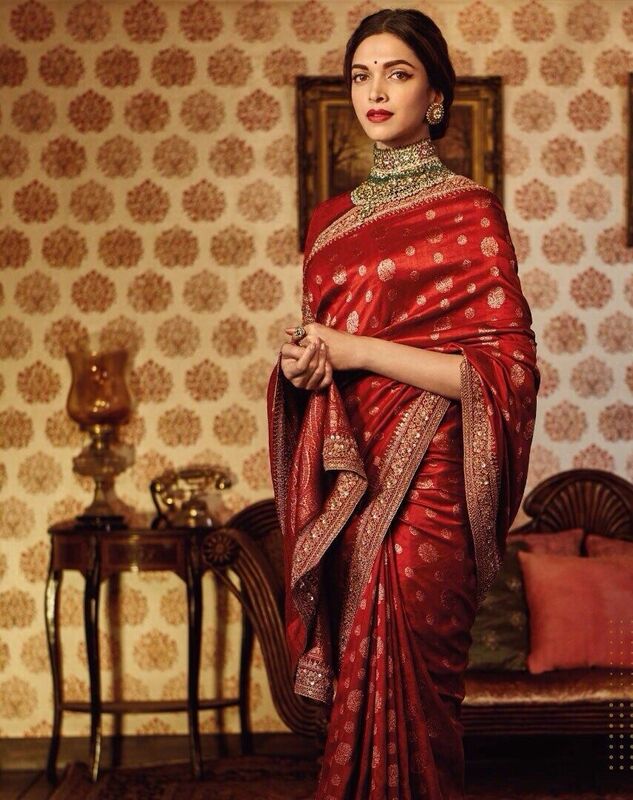 The Sabyasachi saree in which Deepika was seen catching the fancy of all ethnic fashion lovers of the country uses large floral designs on the Bengal’s favourite fabric. Similarly, local, small-scale designers who sell their collection of hand-painted sarees online through social media platforms or personal messaging channels, have also been experimenting. You’ll find a galore of painted and printed Bengal handloom sarees online. It’s not just designers with a costly degree in fashion designing, or artisans from the core handloom belts who are doing this, though. Young painters, talented housewives, creative people stuck in a boring job – they are all unleashing the artist within, with the saree as their canvas. What’s interesting is that they have been going beyond religious images and traditional patterns. The new age saree designers who offer unique handloom sarees online go for some stunning subjects – from the hand-pulled rickshaws on the streets of Kolkata to recreations of famous works of art by painters like Van Gogh and Paul Klee, from the face of a celebrated artiste, to large and realistic paintings of the flora and fauna. They are the reflection of the designers’ spirit, background, and so much more! And this trend has gone large-scale. Recently, the Bengal handloom industry has initiated a project to create sarees with pieces from Rabindrnath Tagore’s famous children’s books, the Sohoj Paath series. Saree lovers have welcomed the trend of innovatively painted and printed sarees. The internet is a huge market where young fashionistas buy handloom sarees online. From office to red carpet, the painted handloom sarees and fashionistas have been making each other look beautiful everywhere. Author Bio: Pen is mightier than the sword, they say, and Oendrila believes in it. She loves to write. It is through her words that she expresses her thoughts and opinions. She considers the social media platforms a powerful tool to hold constructive discussions, and raise awareness about various issues – and words are the only way to go about it. That’s how she tries to survive in this big bad beautiful world.